Aaron Kohl works for those lightbulb moments, when his clients start to understand how all the pieces of the financial plans they’ve developed together will have a significant impact on their future. He enjoys seeing those plans put into motion. There’s a science and an art to financial planning, and a lot of education on his part. Aaron will share projections with his clients that demonstrate the large long-term effects of changing small things today. He learned the value of saving at an early age, when his parents had him set a dime aside from his one dollar allowance. By age 12, his father had given him a basic education on mutual funds. College was not the next step for Aaron after graduating from Doherty Memorial High School in Worcester. Instead, he enlisted in the United States Marine Corps. While in bootcamp, the country suffered the attacks of September 11, 2001, and he entered a signals intelligence group. After two tours in Iraq, he left the military to study economics at Worcester State University. That’s when he met financial advisor Gary Guglielmello and worked part time with him until graduation in 2008. 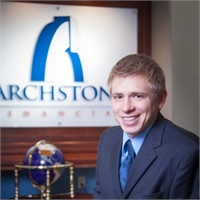 They rejoined forces in 2013 and continued together as Archstone Financial began. When Aaron is not working with clients, he is playing with his four children and supporting his church community in Worcester with his wife.